Summer is finally here! While I LOVE summer, the beach, and all the fun summer fashion trends, what I don’t love is the effect of summer on my skin. My combination skin gets really oily and gross in the summer. The humidity and constant blazing heat also has a negative effect on my acne-prone skin and I usually break out during the summer. Acne breakouts are SUCH a nuisance especially during the summer when I just want to look cute and beach-ready with healthy, clear, and glowy skin. I’ve been on the hunt for the perfect summer skincare routine to care for my acne-prone skin and when I finally found my holy grail summer skincare system, I knew I had to share with all my marblelous babes! I’ve been using AcneFree’s line of products for a month now and it has significantly helped in the care and treatment of my acne-prone skin. 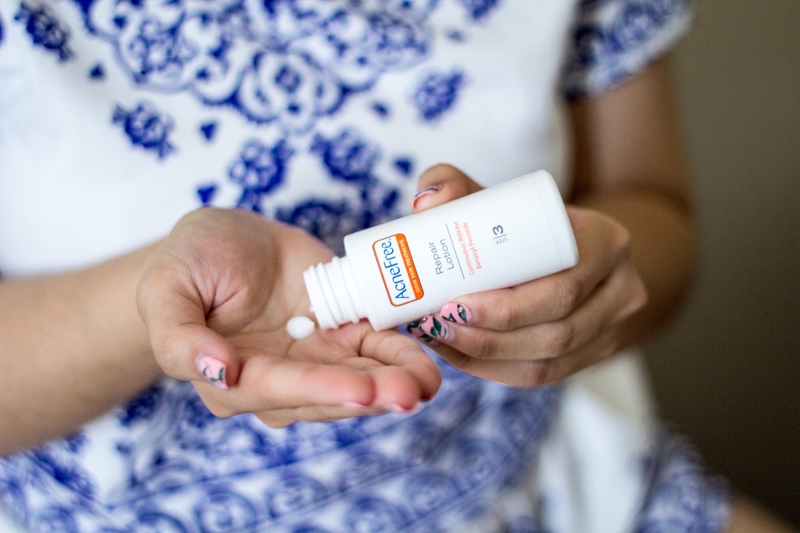 AcneFree offers a complete line of highly effective acne treatment products that can be found at your local Walmart. 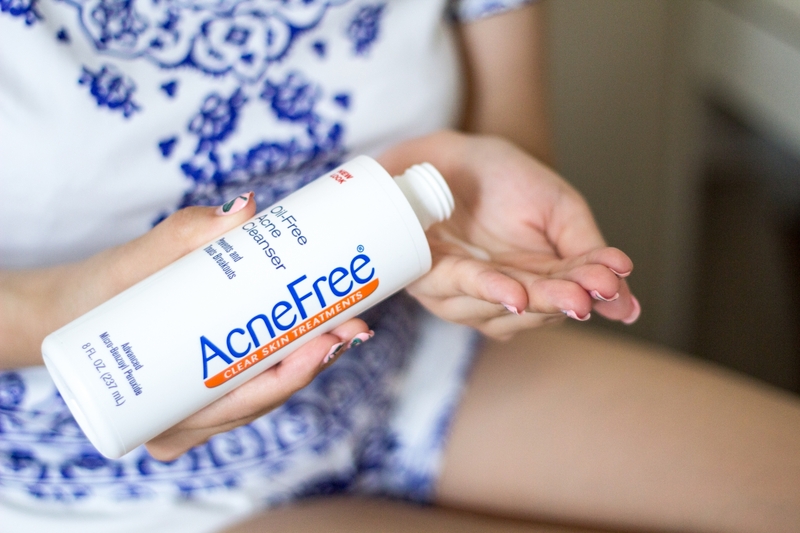 Unlike many other acne treatment products, AcneFree’s products are seriously SO affordable and definitely won’t break the bank! 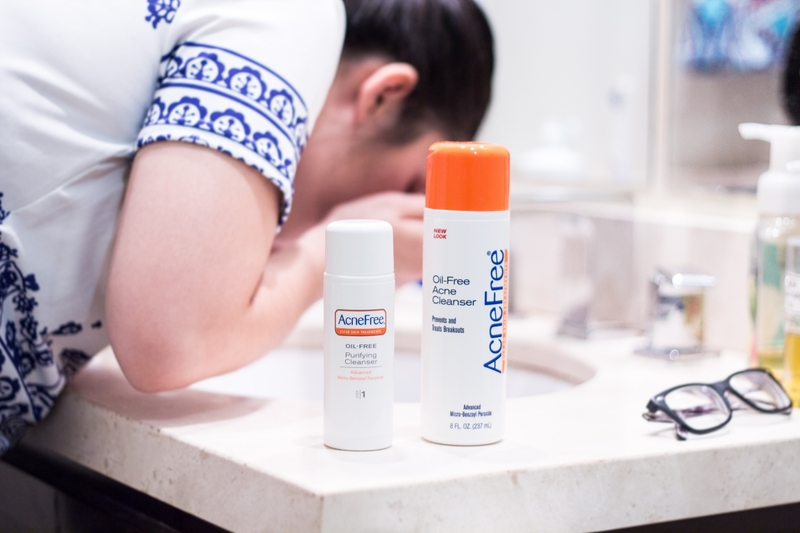 AcneFree is also the only brand that makes acne clearing systems formulated with Advanced Micro-Benzoyl Peroxide, which is designed to work faster and penetrate deeper into pores. 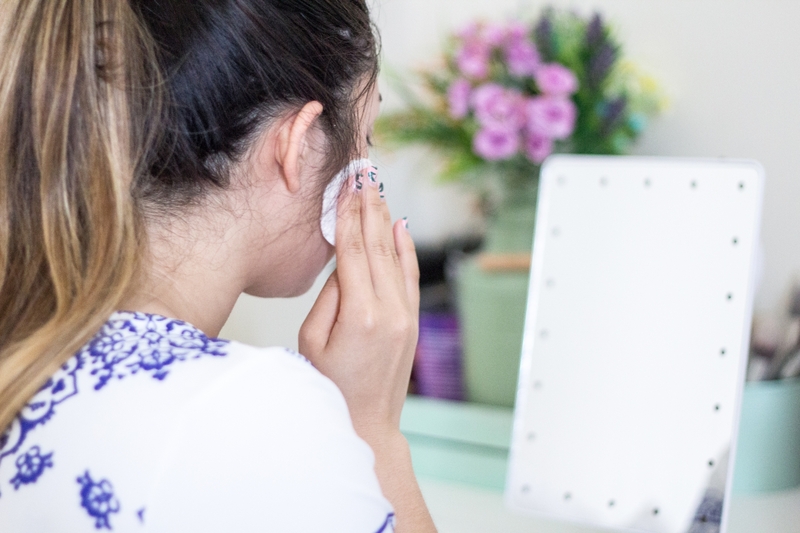 If you have acne-prone skin like me, then be sure to check out my step-by-step summer skincare routine using AcneFree’s 24 Hour Acne Clearing System, Oil-Free Acne Cleanser, and Maximum Strength Terminator 10 below! 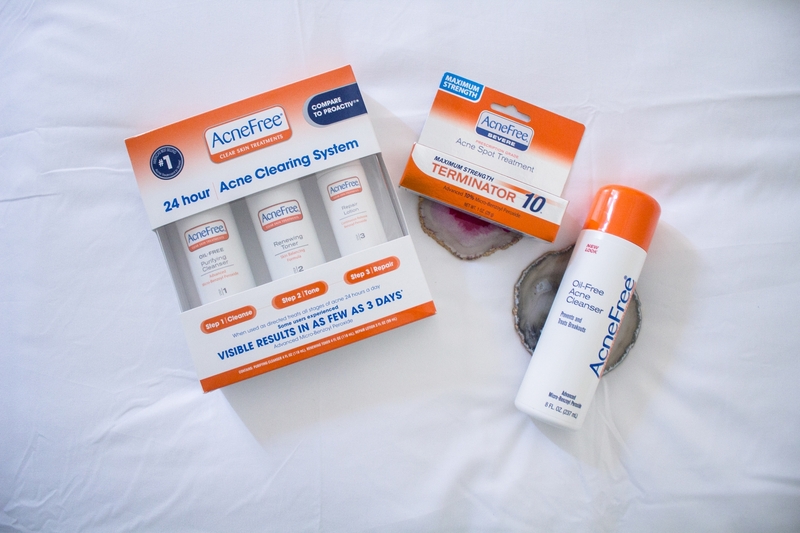 I use AcneFree’s 24 Hour Acne Clearing System for steps 1 through 3 of my summer skincare routine! The AcneFree 24 Hour Acne Clearing System includes Oil-Free Purifying Cleanser, Renewing Toner, and Repair Lotion. What I love about this kit system is that it provides such an easy, daily regimen to follow with only three simple steps! It is perfect for those just starting out with a new skincare regimen! 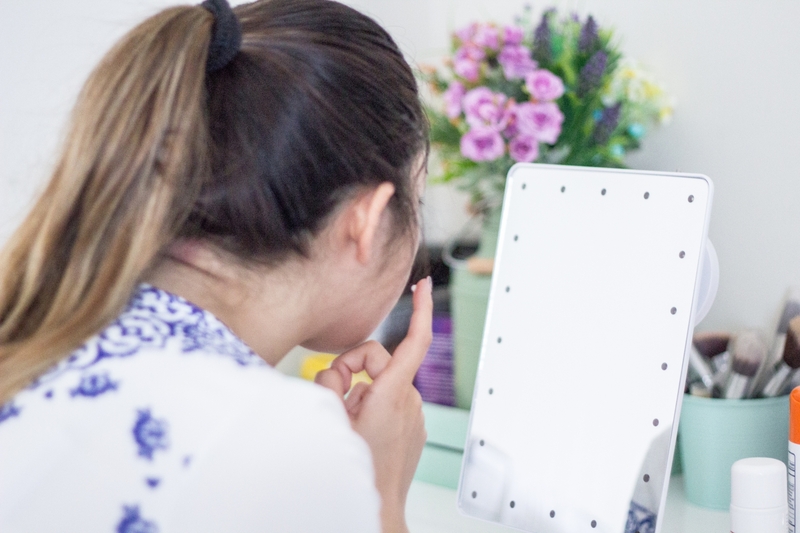 The 24 Hour Acne Clearing System is also extremely affordable at only under $20! 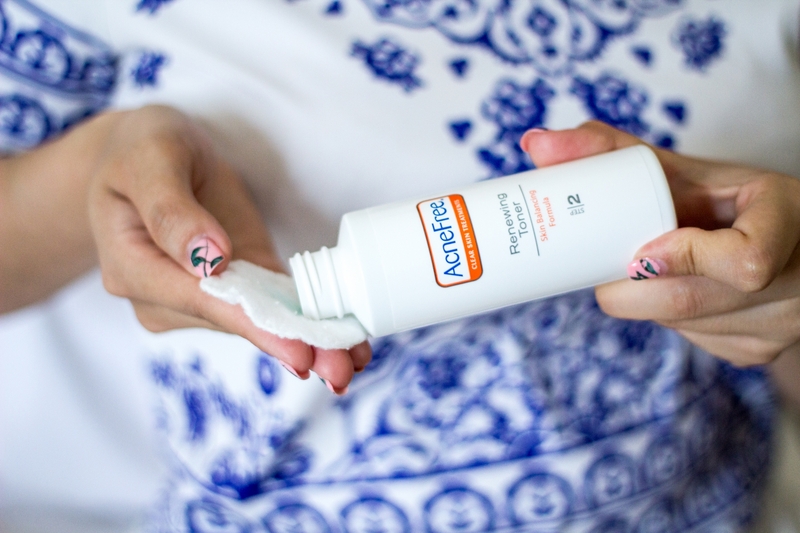 AcneFree‘s Oil-Free Purifying Cleanser is formulated with 2.5% Micro-Benzoyl Peroxide that penetrates deep into pores to fight breakouts, even after rinsing. What I love about this cleanser is that it is gentle enough on my sensitive skin all while deep-cleaning with exfoliating microbreads to remove pore-clogging dirt, excess oil, and to eliminate acne bacteria. If you have body acne, this cleanser can also be used on the chest and back. I love this cleanser SO much that I actually purchased a bigger, 8 fl oz version called the Oil-Free Acne Cleanser! AcneFree’s Oil-Free Acne Cleanser is very similar to the Oil-Free Purifying Cleanser – they both contain 2.5% Micro-Benzoyl Peroxide. But what I love about the Oil-Free Acne Cleanser is that it also contains glycolic acid to exfoliate, smooth, and renew. This cleanser is under $6 and will seriously last you a longggg time! After cleansing my face with the Oil-Free Purifying Cleanser, I use the Renewing Toner. AcneFree‘s Renewing Toner contains vitamins, Witch Hazel (LOVE this stuff!! ), Chamomile, and Aloe to help control oil and balance uneven skin tone. I’m a huge fan of toners and I love how refreshing and revitalizing this toner is! It leaves my skin feeling super soft and refined. I pour about 3 to 4 drops of the Renewing Toner on a piece of cotton pad. I make sure to get enough toner on the cotton pad so that it feels damp and saturated but not too wet that I’m wasting excessive toner. I then proceed to smooth the cotton pad across my face and neck in a gentle wiping motion. I add enough pressure while doing this to reach deep into my pores but not too much force so as to pull at the skin. I use the Renewing Toner twice daily after cleansing my face with the Oil-Free Purifying Cleanser – once in the morning and once at night. If you have body acne, this toner can also be used on the chest and back. After cleansing and toning my skin, I use the Repair Lotion. 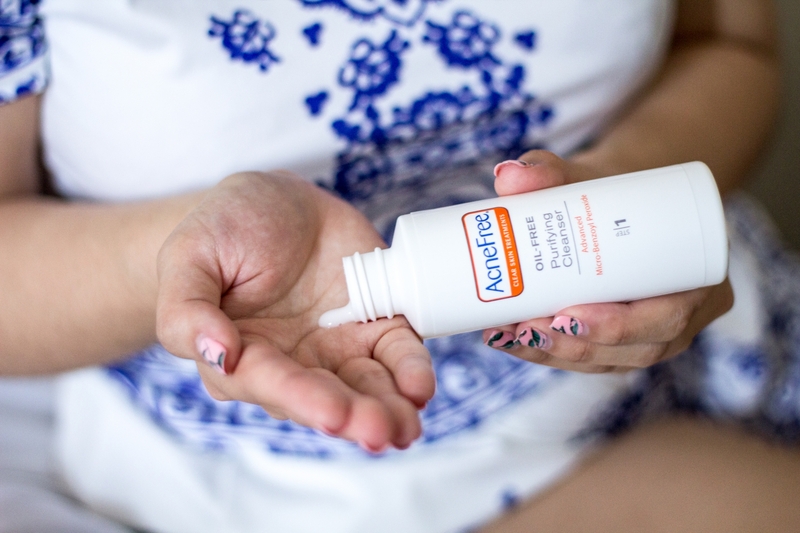 AcneFree‘s Repair Lotion is formulated with 3.7% Micro-Benzoyl Peroxide which is easily absorbed into pores, fighting acne bacteria and helping to stop new breakouts even before they start. 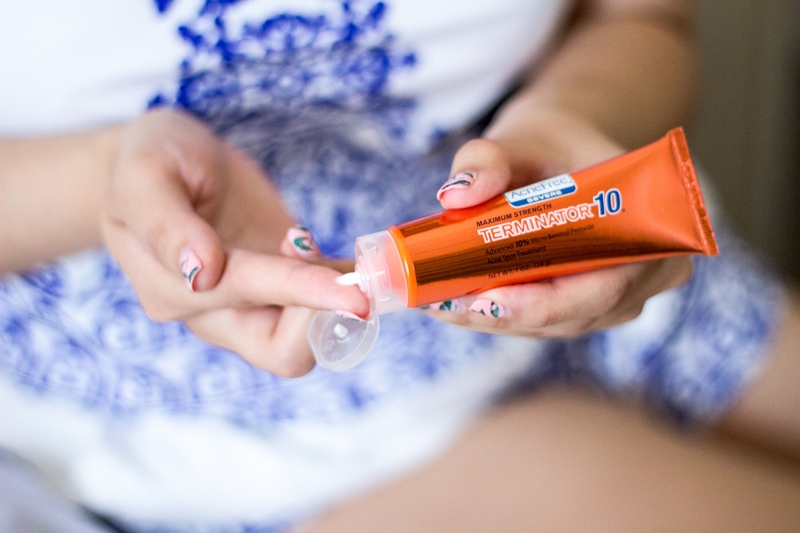 When used twice a day, the Repair Lotion offers 24 hours of continuous clearing. I use about a quarter-sized amount and gently apply it all over my face and neck using the dab and tap method. I dab and pat the Repair Lotion on my face, starting from my T-zone and work my way outwards towards my neck. I then use my fingertips to pat and spread the Repair Lotion in places that need extra attention. Like the Oil-Free Purifying Cleanser and Renewing Toner, I use the Repair Lotion twice a day. If you have body acne, this lotion can also be used on the chest and back. AcneFree‘s Maximum Strength Terminator 10 is a spot treatment that is formulated with 10% Advanced Micro-Benzoyl Peroxide. It is designed to work faster and penetrate deeper into pores to eliminate acne bacteria and fight breakouts between applications. The Maximum Strength Terminator 10 also features a redness control formula that contains Chamomile, Ginger, and Sea Whip Extracts to soothe skin and reduce redness and irritation. I use the Maximum Strength Terminator 10 once a day at night after doing steps 1 through 3. I squeeze a teeny tiny amount of the Maximum Strength Terminator 10 on my index finger and dab it onto any visible acne that I might have. A little amount goes a long way for this product and I love how it visibly clears up my skin the next day! I absolutely love my new summer skincare routine using these AcneFree products! These products have visibly cleared up my skin and I love how I finally have skin that I feel comfortable in, even without any makeup on! These AcneFree products has also helped with creating a smooth, soft, and flawless canvas on which to build my look for the day. I now spend less time getting ready and piling on layers of foundation and concealer to cover up my blemishes. Instead, I can now use all that extra time on my hands to enjoy the perfect summer days by the beach without worrying about my skin! 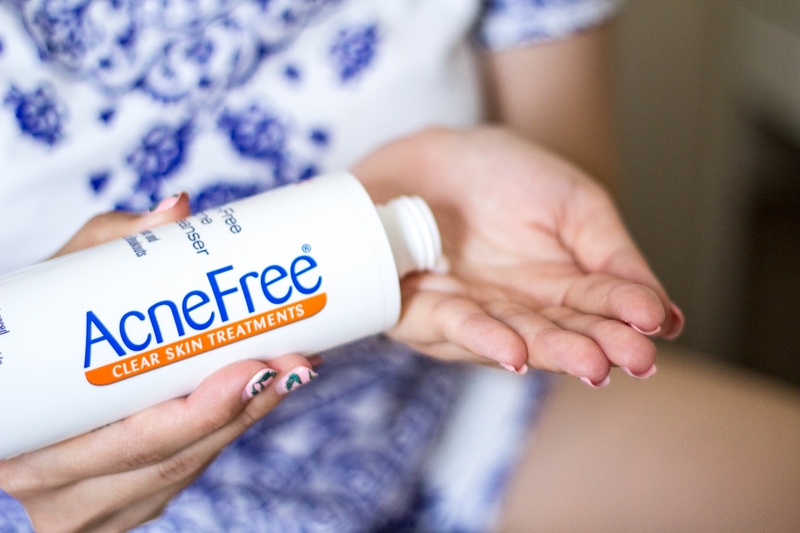 If you’re looking for an effective and affordable skin care regime to care for your acne-prone skin during the summer, then definitely try the AcneFree line of products! You won’t be disappointed! Skin in my teen years! Great post! I haven’t seen the Acne Feee products…looking for a change, so need to try it. Sometimes I can break out but my sling gets dry too. Hard to find the right products.